Controllers from the C (Compact) series represent a family of devices used in building automation. Compact Series PLCs are native BACnet programmable control devices. There is a various range of DIN rail mountable IO configurations.All models have three communication ports: two serial RS485 ports and one USB port. First serial port is used for communication with BMS, SCADA, etc. and it can be BACnet MS/TP or Modbus slave. Second serial port is used as a configuration extension port (Modbus master). USB port is used for service purposes (programming, parametrization, debugging and monitoring). The C series PLCs are interoperable with devices from other manufacturers that support BACnet standard. 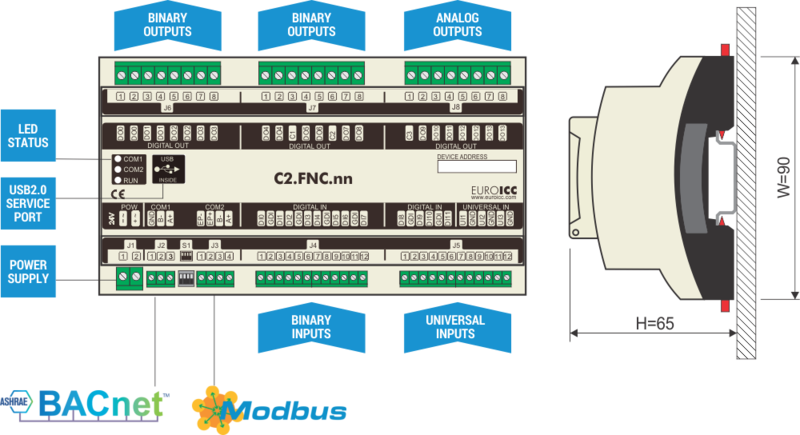 Optionally all devices can use Modbus instead BACnet communication. Thanks to a variety of I/O combinations and flexibility of communication options the devices can be utilized efficiently in the range of applications from single family homes to large public and office buildings. Programming and configuration are done through USB port. 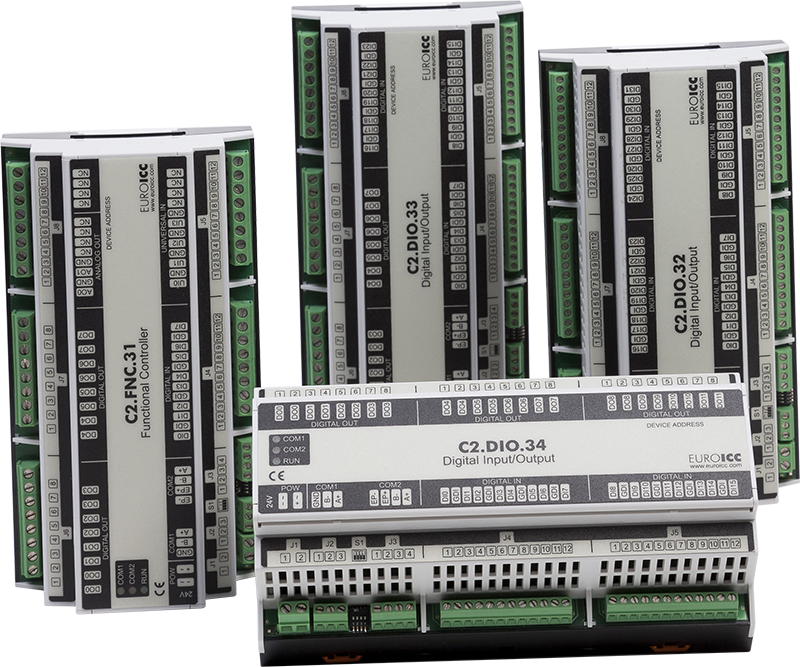 The C series PLCs come in three standard lengths and with various range of IO number and types. Programming is done in functional block diagram language using jPLCPro a EUROICC's programming tool. The PLCs from Compact Series represent a contemporary solution for Building Automation task such as: Fan Coil Controller, Roof Top Controller, Air Handling Unit, Office Controller and Home Controller etc. With additional devices, such as thermostat, RFID card reader and holder, Compact PLCs can be a flexible and efficient solution for Guest Room Management Systems.